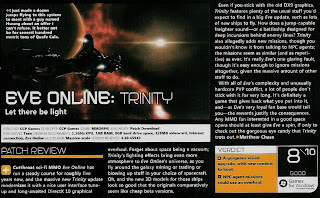 It's not every day that an MMORPG which is about to turn 5 years old get a review in a mainstream gaming magazine. Well EVE did just that in the March issue (#016) of Games for Windows -The Official Magazine. In the Updates section (on page 83) they review Trinity an 8 out of 10 score. On the plus side they mention that visual update that came with the patch is simply gorgeous and that there's new content. On the down side, they complain (with reason) that the agent missions need an overhaul. Couldn't agree more with this review. Unfortunately, they mess-up the DirectX version saying that the overhaul bring DX10, though in reality, Trinity is DX9. As well, they review a a series of PCs as part of an Ultimate Gaming Machine competition, and one of these PC, the one from Commodore Gaming, has an EVE Online skin. Quite cool to see EVE still getting some press after all these years! Guess CCP's hard work over the years is paying off. No offense taken. It's not as if I designed the darn thing! And come to think of it, it's quite a lame looking mod. 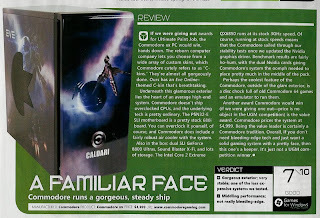 Still, my point was that EVE was getting mainstream gaming mags attention. Which IS kinda cool.